Drone deployment has taken over headlines since the London Grenfell Tower fire incident happened in June 2017 a story in which the picture of a DJI Inspire drone flown by Kent Fire and Rescue took center stage. While the Grenfell Tower incident had significant media coverage, it is far from a singular case. In 2017, fire and rescue operations statistics in England showed more than 500,000 incidents where police, fire and rescue teams were involved. It is standard procedure for the police to work with rescue teams. Distressed people often call the 999 number for police emergencies.The phone operators will then dispatch fire service, search and rescue or medicalservices depending on the situation. The police are heavily involved in search and rescue missions when there is a potential threat to people’slives. Devon & Cornwall and Dorset Police departments formed an alliance in 2016, and started their drone program in 2017. The goal was to explore and implement new technologies so police operations could be more efficient and effective. They quickly found that the deployment of drones created new solutions to old problems. 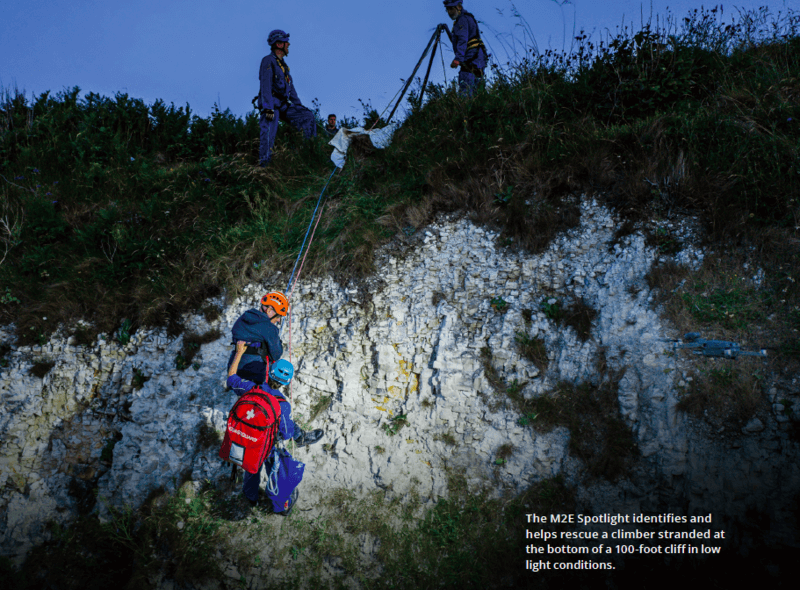 A typical example of police and rescue cooperation is when people get injured or lost while doing outdoor activities like hiking, climbing, or sailing. England’s long coastline is a dynamic playground where climbing or hiking incidents happen frequently. When Devon & Cornwall and Dorset police receive a call for assistance, they conduct the search at the incident site while sending out a request to partner agencies such as Her Majesty’s CoastGuard. During a search & rescue operation, extended flight time is critical. Now with the Mavic 2 Enterprise, the drone operators can fly farther thanks to the battery that supports up to 31 minutes of flight time. What is more, the self-heating battery works in temperatures as low as -4°F (-20°C), which makes a big difference in the mission since accidents happen any time of the year. While the Coast Guard rope team is on the way, the police is securing the area and reaching out to the rescue subject. The new speaker accessory of the Mavic 2 Enterprise facilitates communication between officers and people in distress. Visual or acoustic feedback can be given, and they can rest assured that help is on the way. Once the Coast Guard arrives, the M2E speaker lets teams communicate with each other while the rescue officer is being lowered down on a rope to the bottom of the cliff to save the person. Rescue operations could happen at any time of the day, so having a spotlight is very helpful in low light conditions. With the Mavic 2 Enterprise spotlight accessory, the drone can help pinpoint the exact location of the missing person. “This not only assists them in reaching the person but the ability to illuminate an area during a rescue operation will improve the safetyof those within the rescue environment and help the incident commander make decisions,” points out Tom Shainberg, Devon & Cornwall Police Drone Chief Pilot. This is especially useful on a cliff as placing a source of lighting on a cliff is very difficult. 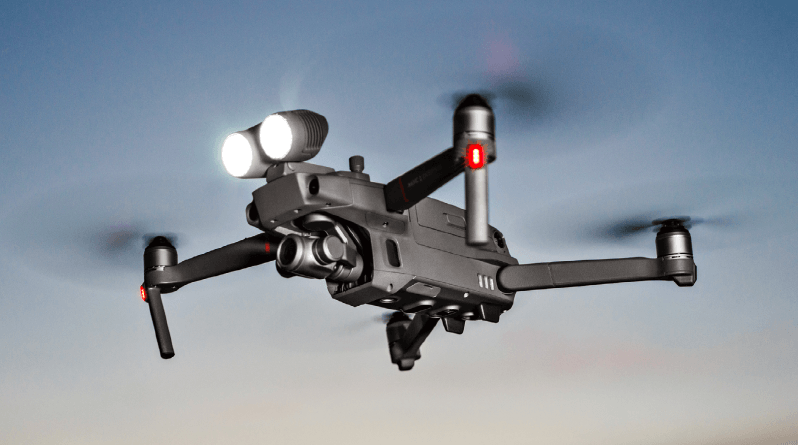 The spotlight of the Mavic 2 Enterprise can illuminate the operation mid-air, as it hovers above the water. Operating a drone in a rescue environment like a cliff can sometimes be challenging. The Mavic 2 Enterpriseis equipped with an omnidirectional obstacle sensing system that keeps the drone at a safe distance away from cliffs, vegetation, and the rope team. The police usually reviews the drone footage after a rescue operation for evaluation and training purposes. This process can be made more precise by the new GPS timestamp. The stamps are integrated in both pictures and videos and provide information about the location and time sequence, which the team can use to access operational details. The new password protection feature keeps all of the data safe during and after any mission. 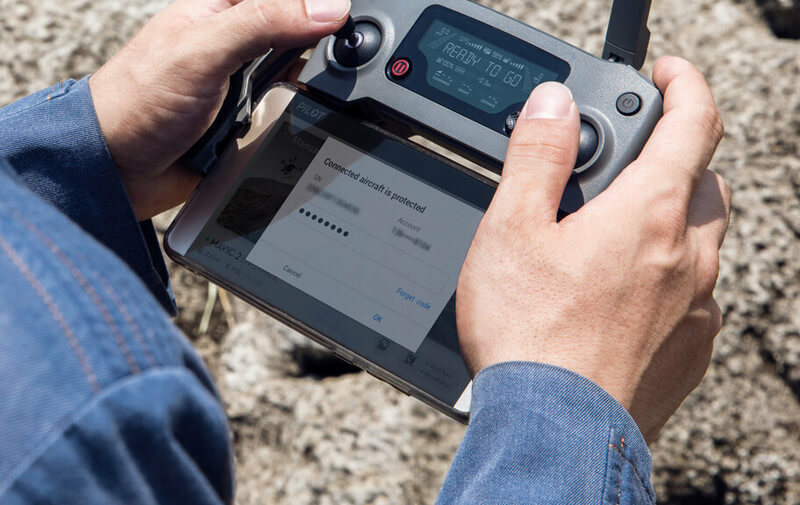 As data security is a sensitive matter for police work, the request to enter a password in order to take off or access the 24 GB onboard storage ensures that the data stays safeeven if the drone falls into the wrong hands. On the application of drones in police operations, Fidler and Shainberg said: “the integration of drones in everyday work makes a huge impact on the results that can be achieved in the future. 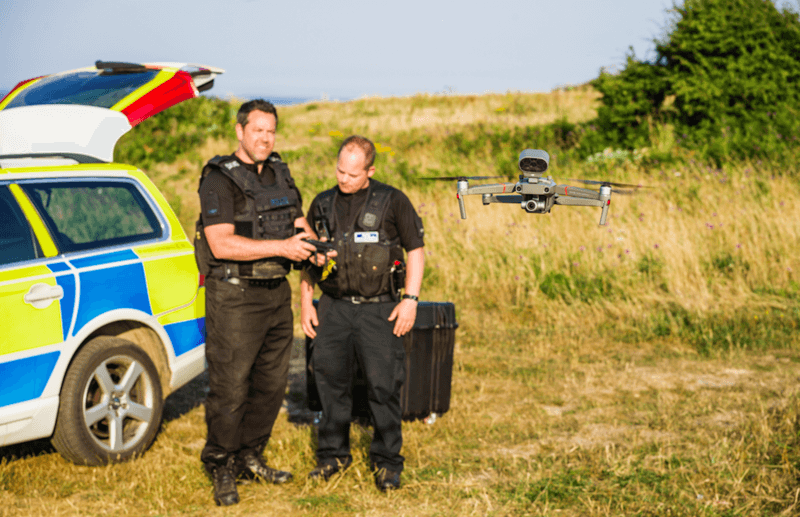 At least for Devon & Cornwall and Dorset, the deployment of drones will be steadily growing, making operations more effective while reducing risks for police officers. Additionally, our cooperation with the rescue teams shows them how effective drones are in daily operations and how beneficial a drone can be as a tool to assist rescue work, encouraging them to dive more into drone usage going forward.” The Devon & Cornwall and Dorset Drone Alliance Team considers the Mavic 2 Enterprise an exciting answer to the real requirements of public safety and law enforcement teams, and is looking forward to working with it. • Subscribe to DJI Enterprise’s newsletter to stay tuned with the latest commercial drone news!